Somebody posted a review of my iPhone game, Word Up!, on YouTube. Hey Marc! Just got a new itouch and checking out all the games. Yours caught my eye as I like word/puzzle ones. May download it shortly. Anyway, quick question, how hard would it be for a designer to create a game like this? I’m not a programer, but am pretty good at figuring things out. Yours looks really good compared to some other apps/games out there and I would love to try my hand at it. I’ll have to look at the tools you mentioned on your wordup page. thanks!!!! I downloaded Word Up to my IPhone two days ago. The first time I couldn’t guess all the words I tried to go to a New Game, but instead of starting a new game I flashed back to the iPhone main menu. When I go back into Word Up I am still in my uncompleted game. Interesting that you changed the name to Word Nerd, but my iPhone icon is still called Word Up. Also, I read that you can get into the dictionary, but I do not see any options for that. My big problem is the inability to start a new game. I have purchased a copy of the Word Up program and it has been telling me the game is done when there are still obvious (to me but not to it apparently) words available to play and add to the score. This has happened a number of times – one I was close to the best score and could have surpassed it but the game said there were no more words to play – “jog” is not a word? Anyway – this is the only problem I have found and it is otherwise a nice diversion. 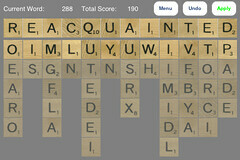 While I (tremendously) enjoy playing your Word Up game, I’m always left feeling “cheated” at the end. Do you know that the game/computer does not include the score of the final word that’s made to your total? Instead, it says “No more words available” (or words to that effect). If my last full word is under 25 points, I’m not bent out of shape, but when I’ve successfully used one of my Qs or Zs in the final play, causing a 73-point word to not be added to my score, I’m not so happy with Word Up.